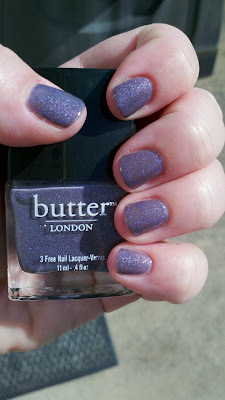 This summer I discovered Butter London's nail polishes and I LOVE them! The colors are amazing and application is so easy! (Just like butter, :)) I have acquired a nice selection of colors but have only had a chance to use some of them. 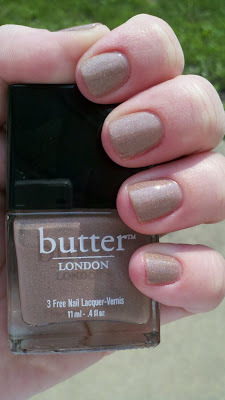 This was my first Butter London application. All Hail the Queen. It is an awesome beige with small flecks of silver glitter. No More Waity, Katie. A grey polish with lavender glitter. 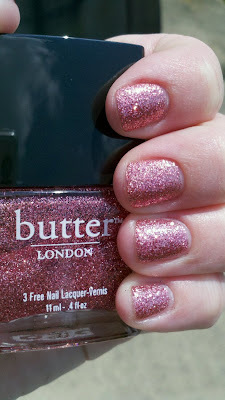 I love the small glitter that Butter London uses in it's polishes, it makes application easy and has excellent coverage. Rosie Lee!!! Such a girlie polish! This only took 2 coats to get total coverage. Usually with a glitter polish you have to apply 3 or 4 coats, not with Butter London.